There's a lot at stake to ensuring that the information displayed in search results is accurate. 86% of consumers say they used a search engine in the last month to find local business information and nearly 80% say that "finding incorrect information would stop me from using a local business". Managing local listings across the search ecosystem is a challenge for single-location businesses and for retailers and enterprises with hundreds of locations, it gets even more complicated. While the business itself is the ultimate source of truth on local data, there are many third-party sources, aggregators and intermediaries that capture and share information across search platforms, apps and sites. That creates complexity - and chaos. Each time the Google index is refreshed - old data is replaced by new data and accurate listings may be replaced with inaccurate ones. Plus, the high incidence of duplicate listings creates consumer confusion and dilutes brand presence. Listings management isn't a "one and done" assignment. It's a discipline that requires ongoing effort and attention. This report by the Local Search Association identifies what's at stake in allowing bad local data to proliferate, why it does and how to address it. 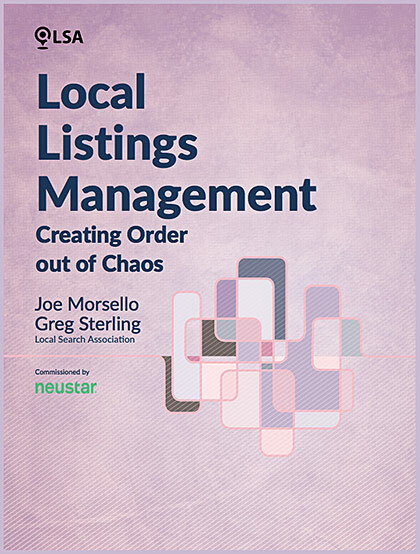 Thank you for downloading Local Listings Management: Creating Order Out of Chaos!